'Fate' is one of those curious words used when things are precariously in the balance, and often at a tipping point, between fortune and misfortune. And, it is one of those strange quirks of life that the coming together of individuals at a given point in time can shape the outcome of a businesses fortunes, either for better or for worse. 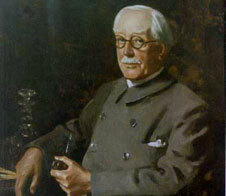 The brewing industry in Britain after the Second World War had a history of 'protectionism' as large scale brewers would euphemistically look after the interests of smaller concerns, under so called 'umbrella' schemes, only to see them fall prey to those ( so say) protecting their very interests. Sadly, in post war Britain, this type of activity had also reached a new level of enthusiasm, and many localised breweries simply disappeared off the face of the brewing map. The malting industry, which has always supplied the essential raw material (malt) for brewers was undergoing a parallel transition, as large scale maltster's would offer 'assistance' only to see them too swallow smaller concerns, and close their facilities. 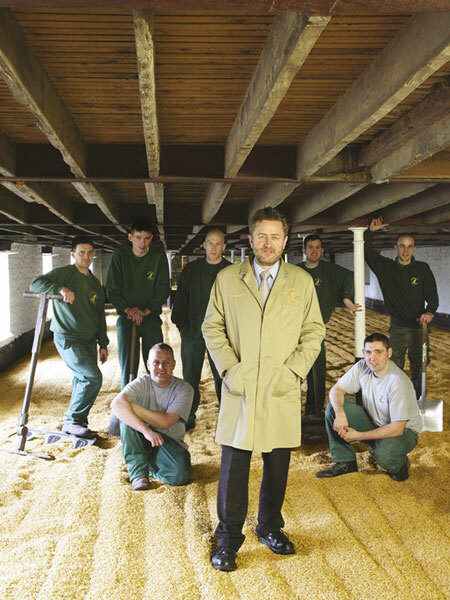 As a result thousands of traditional 'floor' malting's closed across the country, and the industry contracted. For one of these malting's however, the Warminster Maltings in Wiltshire, perhaps uniquely, a reversal of this trend has taken place, and ironically is even providing the inspiration today for new endeavours far from home! On a recent visit to the malting's I was able to meet with Robin Appel, owner of Warminster, and Chris Garratt Head Maltster, and discuss its history, where they are now, and what the future may hold. In terms of history Warminster is certainly the oldest being built in 1855, and in the pantheon of malting history holds a special significance as it was here that Edwin Beaven, the founding father of English barley varieties carried out much of his ground breaking research work and malted the varieties. For Robin this is clearly a proud association "When I purchased the malting's finally in 2001 I was unaware just how important the building was in the history of barley selection" he told me. What makes Warminster unique in the aftermath of change that hit the industry after the war was its connection with one particular company, Arthur Guinness Son & Co Ltd. In 1947 E. S. Beaven Ltd was purchased by Guinness which meant that unlike many smaller companies struggling to find their way in the post war downturn Warminster were in the enviable position of having a ready market and continues demand for there wares. For Chris Garratt (who ever since the age of 16 has been involved in Warminster's fortunes) is candid about what the association truly meant. "The connection with Guinness was an excellent set up, for which we were grateful" but with changing fortunes that would befall Guinness themselves in terms of reduced global demand (or as Guinness would coin it 'over production' in terms of malt ) things were about to change in the 1990s. Chris continued "In 1994 Guinness made it clear they wished to close Warminster and two further malting's, and it was at about this time we looked at the possibilities of a management buyout to keep Warminster afloat". As Chris conceded they needed time, and if Guinness pulled the plug immediately, this would have been impossible to achieve. Chris added "I am thankful Guinness gave us that time with a small breathing space, and contrary to what they originally said an order for 300 tonnes annually". Whilst not enough in itself, this at least gave Chris the opportunity to look for new customers to try and safeguard Warminster's future. But, this in itself was no easy task and Chris found himself in the unenviable position as faced by many a malting company in post war Britain - just 50 years on! Slowly the business moved forward, firstly through supplying regional brewers, and secondly through the growing numbers of micro brewers that had been gaining momentum through the late 1990s . However, it was the intervention of Robin Appel in 2001 that finally put Warminster on the sound financial footing it dearly needed. Robin's invaluable experience in the barley growing arena was to pay huge dividends for the malting's. But for Robin, you could see this was much more than just purchasing a historic malthouse, and is passionate about what this brings to the business as a whole, as he explained " It is all part of a continues supply chain that dovetails so well, from the farmer and grower of the grain in the field, through to production of the finished article in the malting's, and the direct involvement with the brewers and their needs". A relationship Chris Garratt has fostered so well over the years. With Warminster's historical importance acknowledged, it seemed only right that this should also be the home for one of the most recognised barley varieties in the world - Maris Otter (a brand Robin has had rights too since 1995). But, ironically, this is also where the variety would have gained momentum in the past as Dr. Beaven's work would have led onto the famous variety in years to come. So really more of a case of returning home! Robin's enthusiasm and drive is clear "Maris Otter represents the pinnacle of barley varieties" and for the malting's industry in general, often criticised for not doing enough to connect with the drinking public, gives a clear message. In a world where grape varieties such as Cabernet Sauvignon and Chardonnay role off the consumers tongues, Maris Otter needs to be spoken of in the same way, a warranty of quality and intent of what lay inside the bottle for the consumer. But as both Robin and Chris would acknowledge however Warminster is not just about bricks and mortar, but the people within that really make it work, and without the dedication and experience of the employees, at all levels, Warminster would not succeed, and they supply the soul of the business. With the malting's now having an established customer base in Britain Chris is well aware of the potential further afield, and realises that flexibility is called for with the ever changing global situation and markets. Warminster's malt has also found its way into such brewing luminaries as Sierra Nevada in San Diego and Samuel Adams in Boston, and ironically again, it is here that there is the belief amongst certain brewers that 'floor' malted barley has the qualitative edge over the more industrialised techniques, so much so that several craft brewers in the US are looking to build floor malting's of their own, such as Rogues Brewery in Newport amongst others!